Discussion in 'UFC Discussion' started by UFCfightman**, Dec 22, 2012. I never understood why UFC is so hellbent on acquiring other smaller organizations. It's inefficient because UFC is not going to be able to produce stars organically as a big conglomerate organization, there's too many events and too many faces. Smaller orgs have the limited resources so they focus on one or two stars to build up. UFC should just feature those stars ONCE they are name fighters in other organizations. The UFC was never really hellbent on getting other promotions, but if they went up for sale, it was better to aquire them than let all the talent and established names go somewhere else. However, i think that sometimes ot's in the UFC's best interest to homegrow their talent rather than aquire it. Take Lombard for example, after the Boestch fight, it looked like he was a waste of a bidding war and a huge contract. This reads like a paragraph taken out of an essay,so the point seems lost. Are you trying to underline the fact that Ronda should be fighting for a "championship",as your title would imply,in her first fight? Or are you venting your gripe about how the UFC,in your opinion;is seemingly trying to obtain all other,smaller organizations instead of waiting for their stars to shine then acquiring them independently(the fighters)? I'm saying UFC should host the major fights of the sport regardless of divisions, gender etc, but it shouldn't force itself to feature certain obscure fights on the basis of maintaining that division within the UFC. she isnt fight "for" the title in her first fight. she is "defending" her title in the first fight. she is already the champ. She's already blown Dana; hence she is champ. I don't know what this means, but I know I what I like. 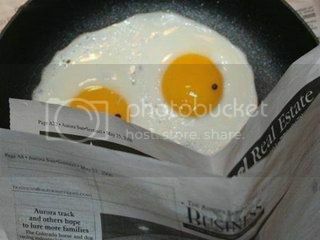 And I like eggs reading the paper. This should be GSPOAB's new av. So I guess Aldo and Cruz also blew Dana. You obviously don't get it. There is no clause in the contracts of all the fighters in other organizations that their major fights should be on UFC. They are under contract. Zuffa purshasing #2 promotions is just business. UFC isn't the Superbowl. It would be more accurately compared to the NFL. Are you not proposing that the UFC should have a Superbowl. No more belts, but a trophy to the winner of each weight class at the end of each year. That would be just stoopid. Cruz fought for the ufc belt. Aldo and Rousey didnt.